LUCKNOW: Uttar Pradesh Chief Minister Yogi Adityanath, facing severe criticism over the killing of Apple sales executive Vivek Tiwari by a policeman in Lucknow, met with his wife and daughters today. 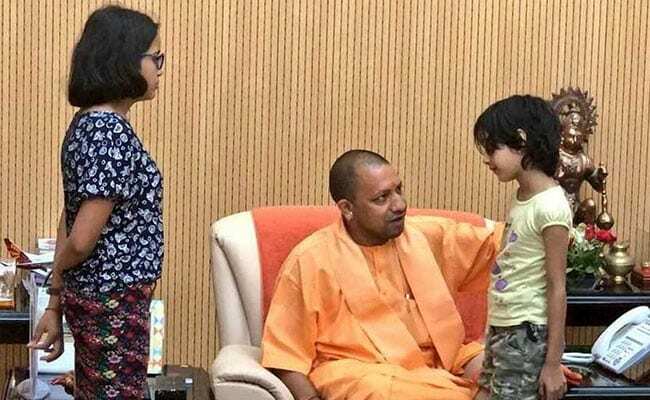 Yogi Adityanath was seen speaking to the executive’s tearful wife Kalpana Tiwari and young daughters, in images from the 25 minute meeting at the Chief Minister’s home. The state government later announced Rs. 25 lakh for the family and Rs. 5 lakh for Mr Tiwari’s children’s education; another Rs. 5 lakh has also been given for his elderly mother. “He heard what I had to say and assured help. I am in no shape to take any strong stand…I had said that I have faith in our state government… today that faith has strengthened,” Kalpana Tiwari told news agency ANI. “All my demands have been met. I wanted strict action against the guilty, a job, accommodation, expenses for education of my daughters and my mother-in-law. The Chief Minister acceded to all my demands,” she told reporters. Yogi Adityanath and Deputy Chief Minister Dinesh Sharma met Vivek Tiwari’s family this morning. Vivek Tiwari, 38, an Apple area sales manager, died after he was shot at by a police constable in Lucknow in the early hours of Saturday after he allegedly refused to stop his SUV for checking. The constable and his colleague have been arrested and sacked amid waves of outrage. Earlier, a senior minister in the UP government had said that senior police officers tried to cover up Mr Tiwari’s murder. Yogi Adityanath has been targeted by opposition parties over the incident and his government’s response. “If I were Chief Minister, I would have first taken action against the involved cops, and only then met the victim family. Not the other way round like the Chief Minister did,” said BSP chief Mayawati. A special investigation team of the UP police, headed by Lucknow Inspector General Sujeet Pandey, visited the shooting spot on Sunday afternoon and spent two hours there. Samples were also collected from the spot – a good 48 hours after the incident.